We’d love your help. Let us know what’s wrong with this preview of Ground Control by Anna Minton. To ask other readers questions about Ground Control, please sign up. 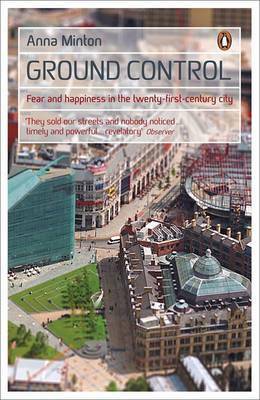 Ground control covers an intensely important issue in modern British life: the alienation of public spaces from the public. One can't even picnic near major London landmarks without being moved on by council wardens. You can't take photographs in the street without being harrassed by the police. Urban designers and traffic planners are engaged to make public places physically inaccessible and unpleasant. Public highways are sold to private companies, who get to make and enforce new rules beyond Ground control covers an intensely important issue in modern British life: the alienation of public spaces from the public. One can't even picnic near major London landmarks without being moved on by council wardens. You can't take photographs in the street without being harrassed by the police. Urban designers and traffic planners are engaged to make public places physically inaccessible and unpleasant. Public highways are sold to private companies, who get to make and enforce new rules beyond the law. This is important stuff. Sadly, this is a basically lazy and incurious little book, written fairly badly by a journalist who hasn't mastered long-form writing. There is one good section: a straightforward journalistic account of the last Labour government's scandalous 'pathfinder' scheme of housing demolitions, which bulldozed houses on behalf of property developers without giving the displaced communities proper recompense. Anna Minton is a journalist, and as such she has picked up a lot of bad habits that make her attempt at a long-form very annoying to read. The standard technique of the newspaper commentariat is to write 500 words consisting of: statement of thesis, personal anecdote, supportive quote from 'authoritative source', restatement of thesis. Five-hundred words, all done. Minton's book repeats this formula over and over. She is also lazy like many journalists are lazy. There isn't a single original thought in this book. There isn't really an attempt to connect the disparate issues covered together with anything other than Minton's preexisting and unexamined prejudices. She also writes with the very distinctively Guardianey tone of a person writing about social problems and the poor from the comfort of a Tuscan villa. Indeed, most of the policy recommendations, such as they are, come from her experiences of living in a Milanese apartment, dining by the Grand canal in Venice and on Roman piazzas, and holidaying in various European capitals. And while she waxes lyrical about her holiday memories (without ever examining them in detail), it is pretty clear that she never really bothered visiting the places in the UK she writes about. It just so happens that she uses my own neighbourhood in East London as one of her examples. She describes a new shopping mall in Stratford as being an alien imposition on the landscape, unavailable and unused by local people. But she didn't survey shoppers to find out where they were from. I don't think she even visited - her description of 'high-end' retail 'out of reach of local people' doesn't match the standard high street offer of the mall. She writes about sitting by the canal in Venice, lamenting that she "couldn't do this in England". Had she walked a few minutes along the Regents Canal or Lea Navigation from the abovementioned mall, she could have found dozens of places to do just that, whether hipster coffee shops at Fish Island, barge-cafes in Mile End, or old Clapton boozers. At one point the book turns from lazy to disgraceful. She spends pages detailing the travails of a family in London and their attitudes to crime. One of the family members looks out from his gated community across the Isle of Dogs and trembles with fear of the locals. Another struggles to find a builder who is willing to remove the security features her flat came installed with. The older members of the family read the papers and worry about the crime rate. BUT THEN, after pages of this, Minton writes: "they are, of course, a fictitious family which I invented to illustrate [my thesis]." Inventing evidence out of whole cloth is no way to write a book. This was supposed to be non-fiction. It made me wonder what other 'interviewees' were invented too. If you go to the Broadmead shopping area in Bristol there are benches where you can sit and lean back and admire the weird pole things that pass for decoration or sculpture in the area. Right next to Broadmead, in the Cabot Circus shopping centre, you can sit admiring the vaulting glass roof and looking down at people milling down into the centre's plaza. But the benches there are giant flat blocks of stone. Lots of people seem to prefer to sit on the steps instead. Why are those benches so obvio If you go to the Broadmead shopping area in Bristol there are benches where you can sit and lean back and admire the weird pole things that pass for decoration or sculpture in the area. Right next to Broadmead, in the Cabot Circus shopping centre, you can sit admiring the vaulting glass roof and looking down at people milling down into the centre's plaza. But the benches there are giant flat blocks of stone. Lots of people seem to prefer to sit on the steps instead. Why are those benches so obviously uncomfortable? Ground Control suggests an answer. One is a public space, in which "doing nothing" is an accepted activity. The other is a private space where spending money is the only acceptable activity. If you want to watch the world go by, pick one of the chairs at Café Rouge and purchase a coffee. One of the criteria for a good book should be that it makes you look at the world differently. I started reading Ground Control in an airport, which have to be one of the greatest expressions of the "clean and safe" philosophy. It's cliché to point out how much like malls airports are (or vice-versa), but the book helped some things about airports click into place for me, including some of the differences between airports and malls. The book is 'journalistic' in style, certainly. Much of the evidence is a little light, and (as another review points out) the comparisons with other European countries are shallow and a bit trite. The chapters are in digestible article chunks, at some expense to a thoroughgoing argument. That's not always a bad thing, though, and I appreciated it being an easy read. Although I agree with the thesis of this book and it makes some good points, I cannot help but wish it was a bit better written. The style grated with me as it included a number of habits that I’ve trained myself to avoid. Examples include frequent references to other sections (‘As described in chapter 7...’), repetitiousness, and use of anecdotal evidence whilst condemning others for doing so. Moreover, the author is clearly not versed in planning and thus does not explain legal concepts like S Although I agree with the thesis of this book and it makes some good points, I cannot help but wish it was a bit better written. The style grated with me as it included a number of habits that I’ve trained myself to avoid. Examples include frequent references to other sections (‘As described in chapter 7...’), repetitiousness, and use of anecdotal evidence whilst condemning others for doing so. Moreover, the author is clearly not versed in planning and thus does not explain legal concepts like Section 106 agreements properly. Whilst it is fair to say that planning jargon is obscure, sometimes wilfully so, this situation is not improved by vague and woolly definitions. Essentially, this could be a great book with better editing; as it is, I can only call it OK.
Griping aside, the key point conveyed by the rambling narrative is an important one. Despite consistent falls in UK crime levels, fear of crime has been growing. Most people simply do not believe that crime rates are falling, despite having little or personal experience of being a victim of crime. The media obviously have a large share of the blame for this trend, as violent crimes and those against children are reported in an incredibly sensationalised manner that deliberately raises fear. (Incidentally, have you noticed how many newspaper headlines include the word ‘fears’? It really does seem like a lot.) In addition, though, this book argues that the nature of the built environment feeds insecurities by creating separation and suspicion between groups of people. Minton argues that gated developments and privatised spaces, which are designed to be secure, feed feelings of fear and insecurity. Being surrounded by gates makes one feel as though there is some threat outside to justify them, as it were. She places part of the blame on the police and their ‘Secure by Design’ guidelines. This is an intriguing addition to the list of parties to blame for the current poor state of the UK urban fabric, as bemoaned in Owen Hatherley’s oeuvre. I will be starting my Masters in Spatial Planning in a few weeks time, and this was top of the reading list I was sent. This book was incredibly thoroughly researched, and was a fascinating introduction to how cities work in 21st Century Britain. While I was reading this I was reminded of Private Island: How the UK Was Sold, another book from which I learnt a tremendous amount about my country, most of it eye opening (in a bad way). I think it is awful that a lot of the information presented her I will be starting my Masters in Spatial Planning in a few weeks time, and this was top of the reading list I was sent. an absolutely excellent read, though a bit depressing about what we have let the UK become and a damming indication of New Labours policy (sell off the family silver cheaply to private capital) that they have built up on thatcherism. Anna Minton has given us a treat with this engaging book, weaving together the privatisation of the space of the city, the urban failure that is housing policy since the 1980s and the paradoxical way that attempts to design cities and policy to make us ‘safer’ finish up making us more scared. This is an excoriation of the contemporary city and of state (nation and local) efforts to manage it through privatisation – in both its economic and its personal meanings. Throughout she manages to channel Anna Minton has given us a treat with this engaging book, weaving together the privatisation of the space of the city, the urban failure that is housing policy since the 1980s and the paradoxical way that attempts to design cities and policy to make us ‘safer’ finish up making us more scared. This is an excoriation of the contemporary city and of state (nation and local) efforts to manage it through privatisation – in both its economic and its personal meanings. Throughout she manages to channel Jane Jacobs – sometimes explicitly, as often implicitly – whose 1961 classic The Death and Life of Great American Cities continues to provide the basis many of the most convincing discussion of human and humane city living and city design. Subsequent writers, such as Harley Sherlock or Roberta Gratz or Mike Davis, have pointed to the problems of inequality, of city spaces that exist for a single purpose so have limited use, to the enclosure of space and of people as destroying urban life. Minton has taken these arguments, these perspectives and looked at early 21st century Britain’s urban and housing policy through the lenses they provide – and the picture she paints is not pretty. Most damningly she highlights policies that are known to fail, where the evidence shows no connection between the policy and better urban living (CCTV, ‘Secure By Design’, ASBOs to point to just three) but that continue to soak up public funds and resources because they give the appearance of doing something effective. In short, this is a compelling argument that space matters, really matters, even or especially when we fail to be aware of it. That the privatisation of the city – not just enclosures through shopping malls but of huge areas of ‘open’ urban space (think, Liverpool One), the enclosure and gating of housing areas, the ‘regeneration’ and housing programmes that encourage owners to allow housing stock to worsen so they can get subsidies and funding to demolish and rebuild, the compulsory purchase orders that impoverish property owners, benefit developers and destroy communities, and community ‘safety’ policies and programmes (ASBOs and ‘Respect’) that reinforce the issues they’re supposed to deal with and make urban areas more of a threat to well-being. The concluding chapter highlights the importance of open space, of democratically (as a daily practice, not an electoral ritual) controlled flexible space and of reconceptualised notions of ‘the public’. Here she is most clearly channelling Jane Jacobs, and arguing forcefully for multi-user spaces where there users are, given the tone of urban moral panics, generationally diverse, and where the city lives throughout the day and night. Good cities, safe cities are diverse, full of pedestrian traffic at different times of the day and night where we meet different people doing different things and become exposed to the diversity and difference of the world around us. In the contemporary city, as Minton argues, building that diversity needs a reconceptualization of space, of publics and by implication of ground control. Written during the last Labour government, some of the policies may have changed, but the situation remains largely the same, if not worse as ‘austerity’ and its cuts to local authority funding have further weakened the public sphere. A remarkable book. Minton started writing this book at a time of economic prosperity (for some) and completed it in the wreckage of the Global Financial Crisis. Anger and seething resistance bubble through the pages. What is happening to cities - London, Manchester, Salford, Edinburgh and Truro - is the punctuation of this book. The loss of 'public good' is clearly revealed and the consequences on people, families and the economy well configured. Minton's argument is profound: “So many of today’s A remarkable book. Minton started writing this book at a time of economic prosperity (for some) and completed it in the wreckage of the Global Financial Crisis. Anger and seething resistance bubble through the pages. Minton's argument is profound: “So many of today’s fractures in civil society have come about as a result of the single-minded approach to extracting the maximum profit from the places we live in, through policies on property." At a certain point, profit is just profit. There is no mystery that supposedly in a time where 'happiness' is so important, mental health concerns are running at record levels. Rather dry (esp after reading A Guide to the New Ruins of Great Britain, also excellent) but a very focused and revealing look at the hopeless state of housing policy and planning in Britain today. Thatcher may have created the problem, but it was in the Blair era that it was utterly compounded. Now housing has become a market driven investment opportunity few can offord, rather than simply places to live. Minton's calm and considered book takes it all to pieces and shows what a shambolic approa Rather dry (esp after reading A Guide to the New Ruins of Great Britain, also excellent) but a very focused and revealing look at the hopeless state of housing policy and planning in Britain today. This book looks at how public land in UK has been sold off to private developers for housing, shops and offices, sometimes all in the one development, and how gated developments are on the rise. I like a lot of the research presented as to how ordinary people have become surrounded by 'tinned up' houses awaiting demolition. Those who don't want to move out of their community are just an obstruction with a tiny voice which the developers counter with legal challenges and further encroachment of t This book looks at how public land in UK has been sold off to private developers for housing, shops and offices, sometimes all in the one development, and how gated developments are on the rise. I like a lot of the research presented as to how ordinary people have become surrounded by 'tinned up' houses awaiting demolition. Those who don't want to move out of their community are just an obstruction with a tiny voice which the developers counter with legal challenges and further encroachment of the dispossessed streets. The councils do not, we are told, build more houses. We also see that when a development has been built and given to a management company other visitors are excluded, or followed, or discouraged from resting. Spaces are not made comfortable. A few dislikes: repetition, self-referent portions, only a small number of areas actually visited (East London, Liverpool, Salford), a made-up story about Tower Hamlets residents when the author is a journalist. No query as to whether an influx of non-British cultures has inspired some East Enders to move to Essex; yes it has. As told to me by a lady whose primary school child had 60% Bengalis in her class, and she said those kids don't talk to London kids. The family moved. A few areas where the author should have done better: no mention whatsoever of environmental impact. Not a single green roof, roof garden, roof rainwater collection or solar panel mounting, nature gardening. Houses are houses are houses in her eyes. Read 'The Urban Birder' by David Lindo to see what bringing birds into London does and where the birds are to be found. As to the 'perfectly good houses' awaiting demolition, maybe they are, but they could require substantial retrofitting to make them insulated to modern standards and disability accessible. New homes are built to higher standards and have a lower carbon footprint for residents. No mention that banks do not want people to pay off a mortgage and sit happily being prosperous for the rest of their lives. Banks want a constant income stream and they get that from interest on loans, and rents. Banks support tiny, singleton apartments being built as they know most owners / tenants will need to move on somewhere bigger. Banks support people trading up again and again because it keeps the householder tied to interest payments. If they can't provide enough housing, banks will happily take rents or fund developers who rent out entire blocks. They want you to rent for life and stay poor. The author tells us that gated communities and increasingly secure cars have evolved in an atmosphere where fear of crime is rising, but figures show that now crime is actually dropping, so she thinks none of it is needed. She does not make the obvious correlation that crime is dropping because criminals can't get at the people, property and cars. In Dublin when the light rail was built, the criminals suddenly had an easy route to get to suburban neighbourhoods and go home with shoulder-bags of silver and jewellery, and steal cars. The householders closed windows and fitted locks and alarms, and car makers were obliged to fit more security. Now the criminals have gone back to the old methods of targeting isolated elderly people or pickpocketing. They do what is easiest. I think a lot of research and careful description went into the book, and I did find it helpful for my own research purposes. Notes 200 - 223. Index 224 - 240. I counted 27 names which I could be sure were female. This was good although not always accurate (I am a town planner in London). Compelling nonetheless, and raises lots of questions. The thesis of this book is important, however, I did not particularly like Minton's style to writing. At times her argument was polemic rather than considered and there is a lot of redundancy in her writing as there is too much repetition. In many ways the book is paradigmatic of much that is wrong with British politics in that while the author tries to give examples out-with London her thesis and the book remains essentially Londoncentric. An obvious glaring omission for consideration is the 20 The thesis of this book is important, however, I did not particularly like Minton's style to writing. At times her argument was polemic rather than considered and there is a lot of redundancy in her writing as there is too much repetition. Thorough and readable approach to a subject that doesn't get enough coverage. Focused on the UK. Unfortunately, the optimism expressed in the book's final chapter has proved unwarranted since the book was published (2009). A thorough dissection of the social and psychological cost of urban planning and misguided social engineering. Anna Minton raises urgent questions about the meaning of liberty in contemporary society and the importance of defending our public space. May be final straw that makes me leave labour party... Very good, there has been a revolution going on in regards housing and commercial development, but we missed it somehow. Also very good on how more CCTV does not reduce crime or even the fear of crime. Comprehensive debunking of the last 20 years of planning policy, private sector take-overs of our towns, and security focused design. Revealing. Disturbing.